When the weather is frightful, it’s difficult not to daydream about a tropical paradise. The vibrant foliage and flowers make the world a whole lot brighter. If work has you dreaming of a seaside escape, try this cheery manicure. It’s not the same as a vacation, but it’ll put a smile on your face while you work. To achieve this multicolored effect, you’ll need four different colors of nail powder. 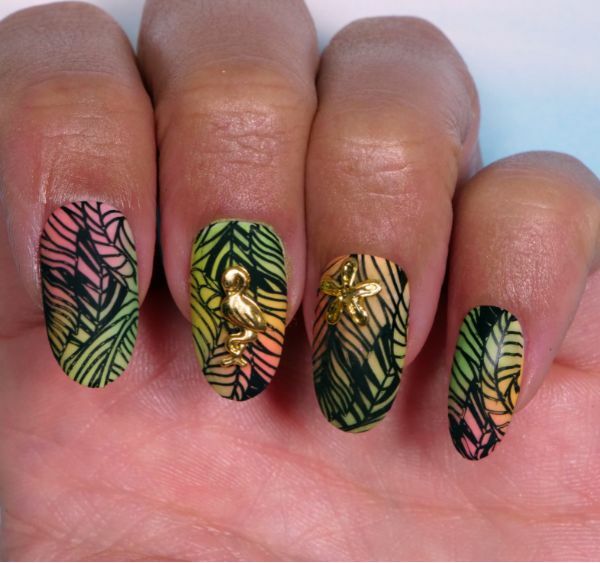 Neon shades provide the perfect backdrop for a stamped leaf design. The video shows a different application method than the standard dipping approach, so make sure to watch it all the way to the end. The fluffy brush keeps the powders sanitary and gives you more control when blending the colors. 1. Apply one coat of white gel polish to the nails, then cure them with the UV or LED lamp. 2. Brush latex tape peel off cuticle guard onto the skin around the nails and let it dry. 3. Paint a second coat of white gel polish on the nails, then cure them with the lamp. 4. 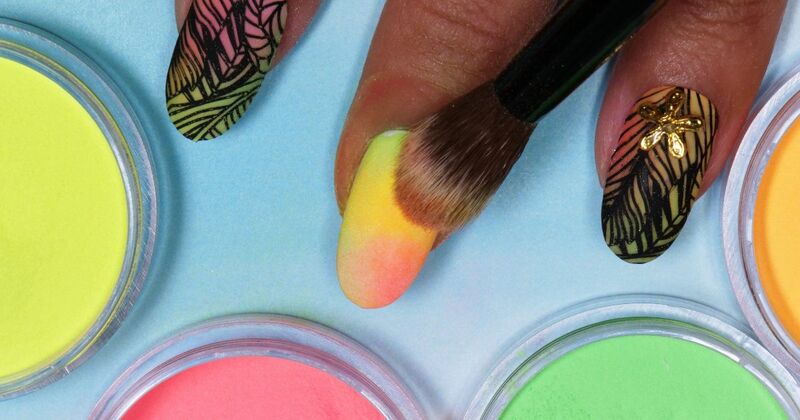 Apply multicolored powders to the nails with a fluffy brush. Tip: Wipe the brush on a paper towel between colors to avoid contaminating the individual jars. 5. Apply a single layer of matte no wipe gel top coat to the nails, then cure them with the lamp. 6. Apply black stamping gel polish onto the top edge of the stamping plate with leaf design. 7. Press the wet polish into the design by dragging the scraper from one side to the other, then press the stamp against it to pick up the polish. 8. Stamp the design onto the nail, and cure the polish once more. 9. Apply a single layer of matte no wipe gel top coat to the nails. 10. Set a gold charm into the wet paint with a wax rhinestone picker, then cure the polish once more. 12. Clean the stamper by pressing it against the sticky tape on a lint remover tool. 13. Clean the stamping plate and scraper with a cotton pad soaked in acetone.